If you don't want to store your important files on Dropbox or Box for security or other reasons, you can create your own cloud storage system. But while the services are secure, generally immune to disasters and usually offer several gigabytes of space for free, there are problems. To begin with, when you use a public cloud storage service, you essentially give up control of the data. It's stored on distant servers, often with many copies spread throughout the world. Even if you erase a file, you'll never know if it's truly gone. And if you need more than the free space allowance, you have to take annual fees into consideration. For example, Dropbox offers 2GB of free storage space (up to 18GB if you refer friends); after that, it costs $99 annually for 100GB, $199 for 200GB and $499 for 500GB. There are, however, alternatives for individuals that combine the security of personal storage with the convenience of the cloud. Called personal cloud storage, this method combines the best of both worlds by storing files on a local networked drive and allowing you to retain full control over your data, while still making files available just about anywhere you can get online. Rather than having your data stored on an anonymous server (or series of servers) spread across the globe, it is right next to your router. (On the other hand, you're vulnerable to a personal disaster, like a fire or flood -- so it's a good idea to arrange for off-site backups.) The data is password protected and encrypted, and when you delete something -- whether it's an embarrassing photo or confidential financial document -- you know it's gone. And once you buy the equipment, there are no annual storage fees -- ever. To see how this class of personal cloud systems can help put data in its place, I obtained three new devices: the LaCie CloudBox, Western Digital's My Book Live and D-Link's ShareCenter 2-Bay Cloud Storage 2000. Three ways to have your own private cloud. From left to right: Western Digital's My Book Live, the LaCie CloudBox and D-Link's ShareCenter 2-Bay Cloud Storage 2000. Each offers its own mix of ways to connect locally or remotely via computer (and sometimes game consoles). The devices also offer a variety of remote access apps for iOS, Android, BlackBerry and Windows Phone devices. Shop carefully, though, because not all these devices cover every OS. Although they look quite different, these devices have a lot in common. All are small enough to fit on a bookshelf or otherwise sit out of the way. Each device uses a wired Ethernet connection to connect to a router; none uses Wi-Fi. Finally, they all provide data encryption. How you access your files differs from device to device, with some offering preview thumbnails of the documents, others only a list of file names. Click and the documents appear on-screen, although there's a lot of variation in how long this step can take. In addition, each of the systems offers a way to share documents, images and videos with others. Article update: This review was originally published in 2013. As of February 2016, some prices have been changed and some products are only available through third parties; these have been noted. I put each cloud device through its paces, checking for how hard it was to set up and how easy it was to access my files remotely. I also did performance testing for how long it takes to send files to the drive and retrieve them on the go. Whichever one you choose, you can be sure exactly where your bits and bytes are and that -- after the initial purchase -- they're not costing you a penny in rent. If ease of use is what you're after, LaCie's CloudBox is the easiest of the three devices reviewed here -- from opening the box to having your data available wherever the day takes you. The sleek, white CloudBox has minimalist styling and is the smallest of the three, measuring 1.7 x 4.8 x 7.6 in. The review unit came with a 1TB drive (920GB available for data) installed; LaCie also makes 2TB, 3TB and 4TB versions for $150, $180 and $250, respectively. The CloudBox doesn't have a fan, but it has lots of vent holes in the back and underneath; after about a month of usage it stayed cool. Under the front panel is a hidden LED that lets you know if the drive is on and active, but it's harder to see from across the room than the lights on the other storage systems. I found setting up the CloudBox to be the easiest operation of the three in this roundup. All the software is on the drive -- just plug it into the router or a network node, power it up and open Windows Explorer (for PCs) or the Finder (for Macs) to start the Dashboard software. If you get lost during the procedure, there's a Help link on the right side of the Dashboard interface. The CloudBox also works with Linux computers as well as PlayStation 3 and Xbox 360 game consoles, but you'll need to set access up manually. It took me about 10 minutes to get it going with a Windows 8-equipped Dell Inspiron 15 laptop. LaCie's Dashboard software provides a way to pick automatic or static IP addressing, change the drive's name, map it and adjust its power conservation settings. The system can store backups produced by Time Machine or Windows Backup, but it lacks a network diagnostic test like the one on the My Book Live. Your stored files are accessible from local or remote computers using the company's myNAS website. Once you've logged in, the site shows a list of the drive's items along with details like size and image resolution; click on any to see a thumbnail version in the lower left corner and save the file locally. The myNAS website shows a list of the drive's items along with details like size and image resolution. There's an iOS-based app called MyNAS (none for Android, BlackBerry or Windows Phones). The app works with Office, PDF, MP4 and MP3 files. It presents you with a list of folders and files that you can click on to view -- the images are rather small (not surprisingly); they can be blown up to fill the screen, but in that case, they're rather fuzzy. Images can also be viewed as a slideshow. There are two ways to share files stored on the CloudBox. As with the others, you can create a special log-on and password for a guest to have access to a special folder. Alternatively, you can use LaCie's Wuala online storage service, which provides 5GB of free space. To share items, Wuala creates a Web link that can be emailed. The recipient doesn't need a Wuala account. The CloudBox led the three in transferring 430MB of assorted files onto the drive with an average speed of 7.0MBps. Its 10.6MBps read and 11.4MBps write operations as measured by Crystal DiskMark were in the middle of the pack. It took 42.2 seconds to get a 3.2MB image on the screen, the slowest of the three by a wide margin. 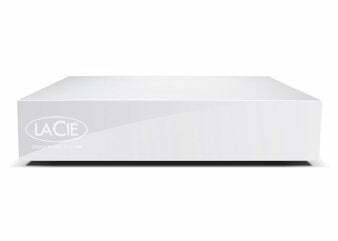 LaCie offers a two-year warranty on the CloudBox, a year shorter than the others. Its $120 price tag, good performance and general ease of use make it a good buy.